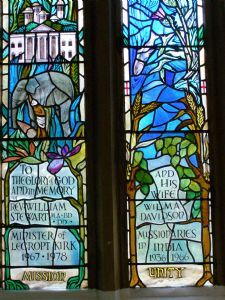 For a small church Lecropt has many famous and beautiful stained glass windows. Of course the photographs do not do full justice to these interesting windows. If you wish to view them at first hand and in glorious colour please contact the Minister so that we can arrange access at a mutually suitable time. 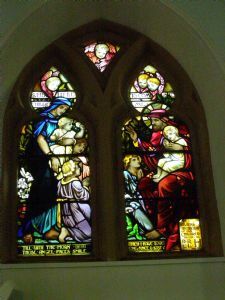 This window was the gift of Lawrence Pullar in 1911. It was designed by Alfred Webster not long after he finished his studies at Glasgow School of Art and only a few years before his premature death in the trenches of Flanders in August 1915. 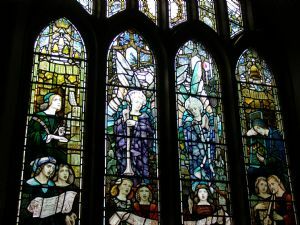 The window has four lights set within Perpendicular tracery, which is more elaborate than that of the windows in the nave, and contains all the hallmarks of Webster’s style. 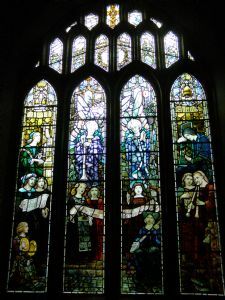 Its subject is the praise of God in music, based on Psalm 150 “Praise God in His sanctuary”, which is illustrated by an imposing composition of musical figures extending across all four lights. manuscripts and instruments are evidence of Webster’s detailed knowledge of Christian art. 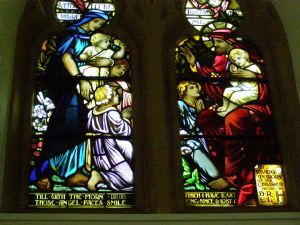 Another feature of his work can be seen in the tiny cameos of minute detail almost hidden in the overall grandeur of the whole window. See if you can discover the blue songbird, the tiny harpist; a slain dragon; a face embroidered on a tunic; miniature swords and droplets of blood, and melting candle wax. 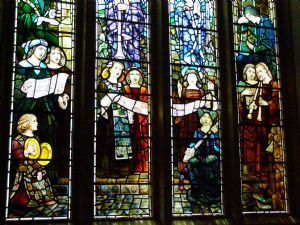 The overall result of this example of Webster’s craft is a powerful and inspiring window, which admits and filters the western light and, through its texts, fulfils one of the prime functions of religious stained glass, that of glorifying God. That I have loved long since and lost awhile”. 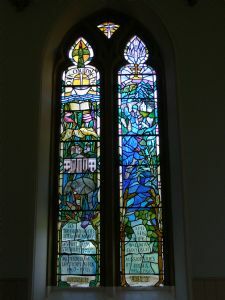 This window, in the north wall of the Nave, was designed by Roland Mitton. It commemorates DR William Stewart and his wife Wilma and was installed and dedicated in 1990. Dr Stewart was minister at Lecropt from 1967 to 1978, having been previously Principal of Serampore College in India. 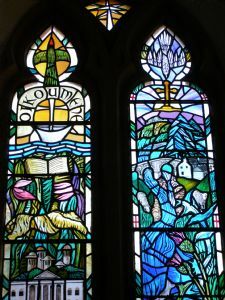 The two lights depict these two aspects of Dr Stewart's ministry; their themes are Unity and Mission, ideals which were integral parts of the life and work of this distinguished scholar and missionary. The window's legend -the explanation of its content and symbolism - is explained in a leaflet produced to mark the dedication of the window.